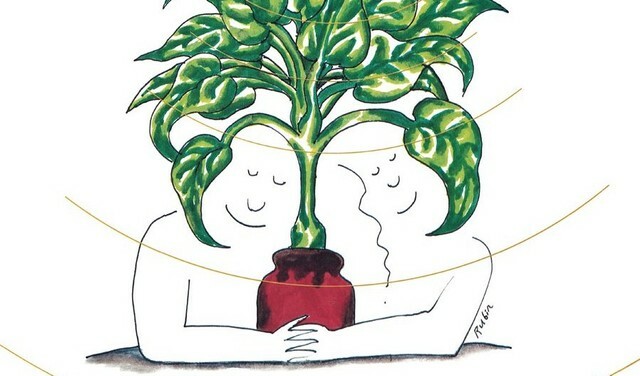 In 1976, synth pioneer Mort Garson released Mother Earth’s Plantasia, an album of “warm earth music for plants…and the people who love them,” according to its subtitle. Originally released as part of two bizarre promotions—one with Los Angeles’ Mother Earth plant shop and another with Sears, who gave the album away with Simmons mattresses—the release has achieved cult status with record collectors, regularly reselling for over $300 on Discogs and inspiring the recent Kickstarter documentary Finding Plantasia. Now, Sacred Bones has announced the first official reissue of the album on vinyl, CD, and digital platforms. Best known in his lifetime for his work a session musician, Garson performed on countless soundtracks including the score for Richard Burton’s Grammy Award-winning recording of Antoine de Satin-Exupéry’s The Little Prince. Garson’s work in the 1960s brought him into contact with Robert Moog, whose early synthesizers inspired him to compose pieces around the instrument. “When my dad found the synthesizer, he realized he didn’t want to do pop music anymore,” Garson’s daughter Day Darmet shared in a press release. In the mid-1970s, Garson began work on an album composed for plants and their caretakers. Equal parts daringly visionary and complete kitsch, the album spent many years after its release relegated to discount bins, garage sales, and dusty basement collections before making a surprising comeback in the last few years. As part of Sacred Bones’ new reissue, the album is now available on streaming platforms, with physical copies on green vinyl, black vinyl, and CD to follow on June 21. The reissue features restored cover art from renowned visual artist Robert Beatty and new linear notes from SPIN contributor Andy Beta. Listen to the full album below and preorder Sacred Bones’ reissue here.